The U.S. Department of Justice on Friday called for the dismissal of a lawsuit alleging President Donald Trump violated the constitution by accepting foreign payments at his hotels. 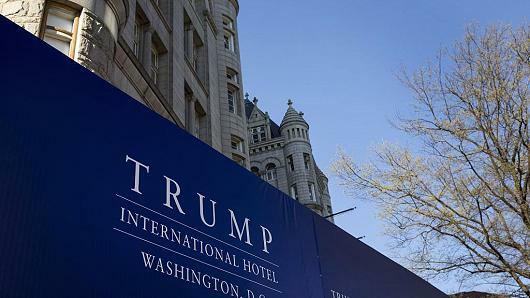 The lawsuit, filed in January, said Trump violates the Constitution's "emoluments" clause, which bars him from accepting gifts from foreign governments without congressional approval, by maintaining ownership over his business empire despite ceding day-to-day control to his sons. Now, this is just absurd on its face. This was the one instance in which even Trump himself seemed to understand was a conflict of interest -- remember his promise to donate the proceeds from foreigners to the government? Attorneys general for the District of Columbia and the state of Maryland say they will sue President Trump on Monday, alleging that he has violated anticorruption clauses in the Constitution by accepting millions in payments and benefits from foreign governments since moving into the White House. Norman Eisen, who served as White House ethics lawyer for President Barack Obama and is CREW’s board chairman, said jurisdictions such as D.C. and Maryland are among the “most perfect plaintiffs” to sue over emoluments because they have a coequal say in making sure the Constitution is being enforced. Eisen's not pulling any punches, and he also seems to think that this has legs.